I am going to be honest. Straight-up. I’m not really what you call a ‘jewellery person’. Yes I enjoy sparkle’s and lusting over object of adornment but that’s generally were I left it. I didn’t even consider getting my ear’s pieced until I was 13. I did go through a phrase when I was seventeen of stacking my bracelets up my wrist with pieces I collected on holiday which for a while was followed by festival wristbands. 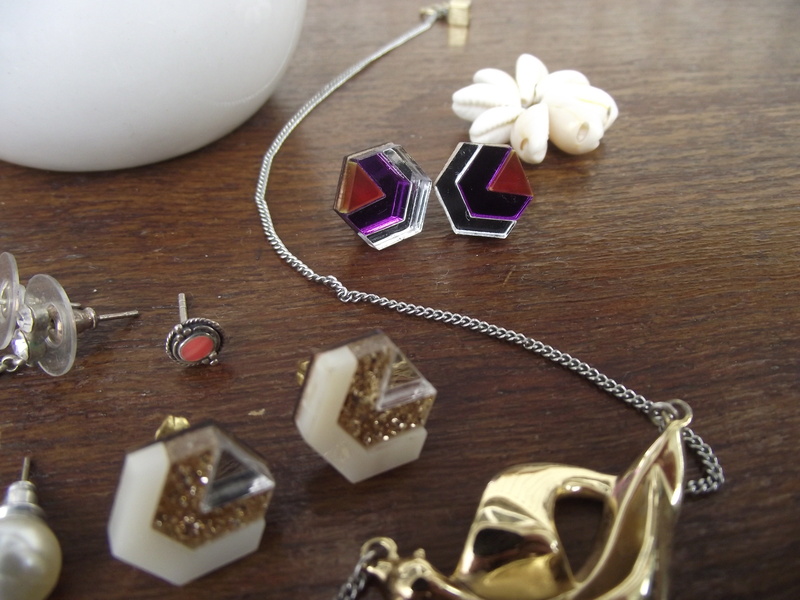 I also debated other piecing’s but never did after the realisation that I didn’t really wear jewellery. Having said that I have always had a little bit of a mini collection. Now my collection is considerably smaller but each pieces holds some sort of importance or/and sentimental value. 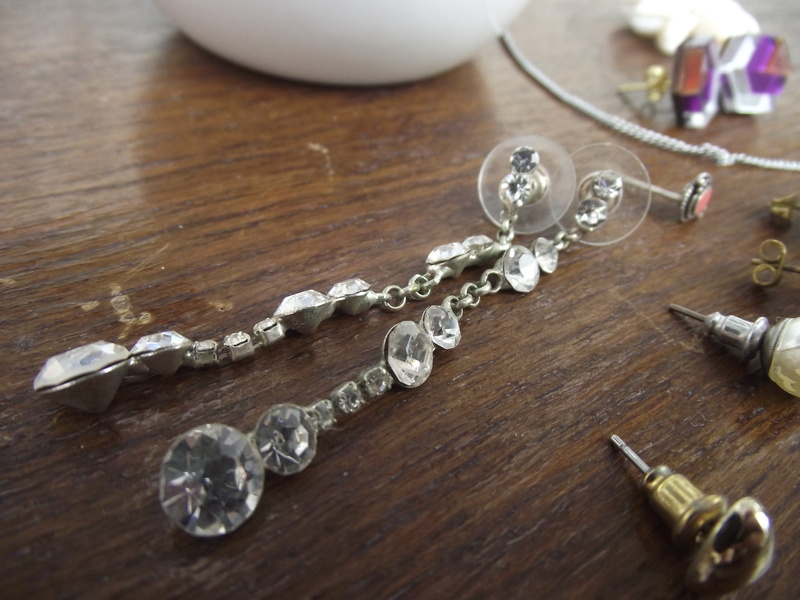 Here is a little peak into my ‘Jewellery box’. Currently my jewellery box is this sweet but simple Owl trinket box which I got as a lovely gift last Christmas. Its cosy inside but that just means each piece is special and usually worn more regularly than other pieces I might have laying around. This is also the place where odd earrings end up when I can’t bear to part with them, in the hope that one day I will find there counter-part. I have three odd earrings in total. Odd Earring 1: is this dainty oval silver earring with a coral centre. I brought these as I was out of the habit of wearing earrings but didn’t want my piecing to close up, so I brought these just before going back to uni as they were small enough to leave in and made of silver which meant I could do so with out consequence. Odd Earring 2: I don’t know if you can tell but its a small metal heart `which is from a set I picked up from Topshop years ago but for some reason I have been able to part with. Odd Earring 3: Is just a fake pearl but despite it being odd and not even real, I’ve been holding on to it almost as a reminder that I need a pair of simple pearl earrings. Abstract bird necklace: This is a necklace which is quite personal to me and at one point I was wearing it everyday. I don’t want to bore you with the meaning of this piece as it was a lovely and thoughtful valentines gift but I will say what makes this peice visually interesting is that you can’t tell straight-away that it’s a bird the way the metal organically links together almost like an eternity ring. Its a piece that I am very fond of indeed. Long diamond-like Earrings: These earrings I’ve had since I was sixteen, I brought these while I was shopping for Jewellery for year 11 prom. Its not something I would have usually chosen but I decided that as there are only a few occasions you can treat yourself I decided to go for it. I have worn these since as well and I am sure I will wear them again but each time I will be reminded of when I was sixteen searching in Accessorize for the perfect finishing touches. 2 Pairs of Hexagon Earrings: I have very fond memories of these earrings the design of which I first stumbled upon in Camden. I wish I could remember the designer of whom I discovered at a pop-up shop at the Collective (http://camdencollective.co.uk/) where all of these talented and creative people had the opportunity to get there work out there in one place. There were illustrated plates, beautiful prints and leather bags but there was something about this Jewellery designer and the materials they used really capture my senses. Laser-cut acrylic backed on rose wood in geometric shapes, after staring at this jewellery and eventually dragging myself out I instantly regret not buying them but by that point I was in a gig at the electric ballroom enjoying the night. A couple of weeks later my boyfriend told me he had a gift for me and to my surprise he remembered I liked these and traced them online. It’s not until I actually sat down and started writing this I realise how little Jewellery I had. As I mentioned at the beginning I knew I didn’t have a vase amount but going through what was actually in the trinket box I used the most made me realise that I really need to find the old and forgotten pieces that I know I have. I started writing this post as I find it fascinating how just an object to one person can retain so many memories to another and I wanted to share with you some jewellery pieces that on paper aren’t worth a lot but to me they are something special. 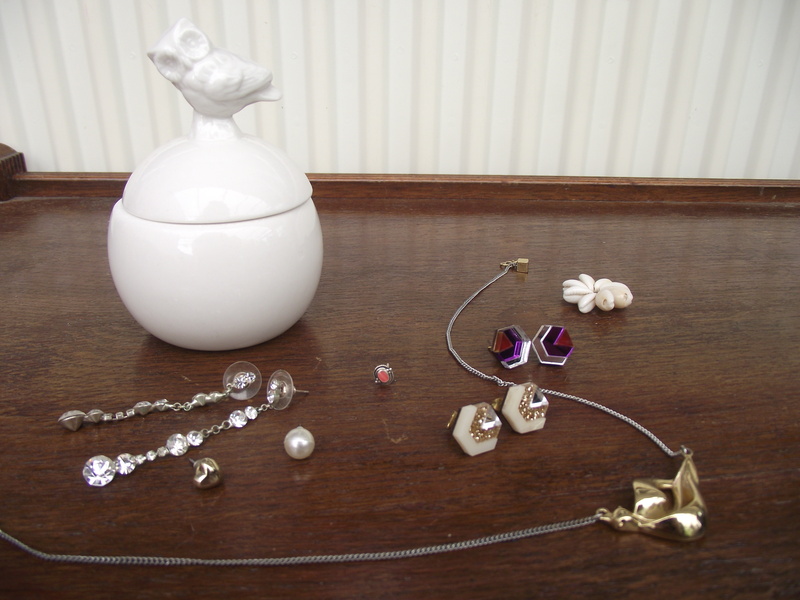 I would love to hear if you have any Jewellery or clothes which hold special memories to you.